during the Student Research Symposium. Courtney Rieb could not help but notice the boy. The first-grader, a student in the classroom where Rieb completed a clinical placement during her first professional seminar, inspired Rieb to develop and deliver an intervention. And she had help – from the young boy himself. “I wanted to help him self-manage his behavior. I worked with him to come up with some goals for what it would look like for him to be on task, to keep his ‘eyes on the prize.’ Classroom rules. Doing homework. Being a model for his peers,” she says. 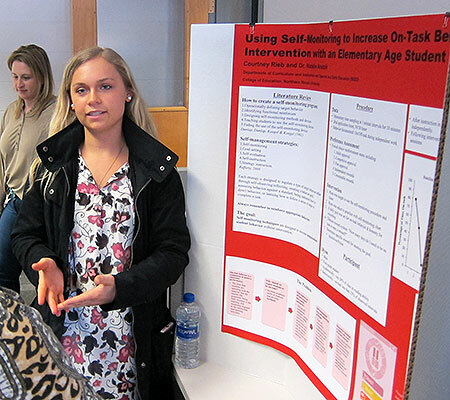 Rieb turned her work with the boy into a research project, one she shared not only at the April 18 Undergraduate Research and Artistry Day but at the College of Education’s Student Research Symposium two days later. Eight students joined her in poster presentations. 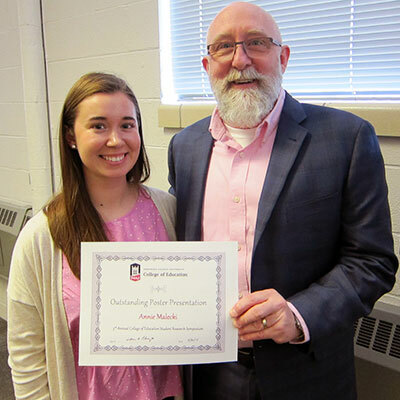 Annie Malecki, of the Department of Kinesiology and Physical Education (KNPE), took the undergraduate award for Outstanding Poster Presentation. 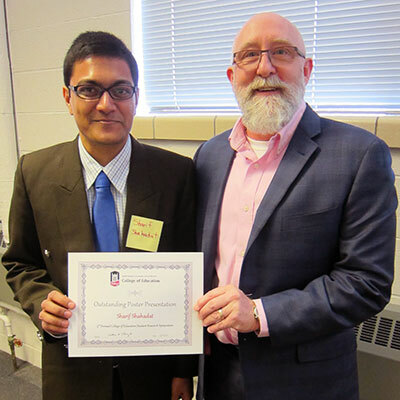 Sharif Shahadat, of the Department of Educational Technology, Research and Assessment (ETRA), won the graduate-level award. 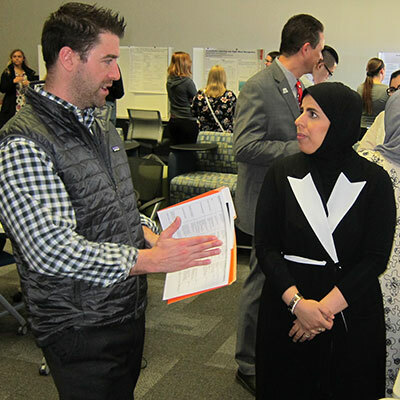 Other presenters included Dalal Alfageth, Kylie Cousins, Rania Kokandy, Alexandria Patinka, Addison Pond, Kathryn E. Rupp (a master’s student from the NIU Department of Psychology) and Steven Smart. Graduate students Joshua Pak and Wilson Hernandez Parraci, from KNPE and ETRA respectively, gave table talks. “Students presented studies from didactic and clinical classes as well as extracurricular engagement. I was very proud to see the expertise and effort that went into their work,” Pitney says. at the Student Research Symposium. So says Natalie Andzik, an assistant professor in the Department of Special and Early Education. 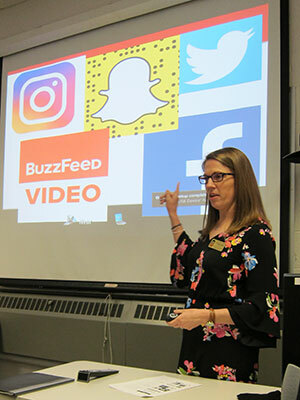 “It was very rewarding for me to see pre-service, general education teachers take such an interest in developing interventions for students with disabilities in their clinical placements,” Andzik says. Patinka adapted a kinesthetic intervention for a first-grade girl struggling with “sight words” – high-frequency words that young readers should recognize without sounding out or decoding. “I looked at baseline data from the district’s test for sight words; there are 68 words, and first-graders are supposed to get 68 out of 68,” she says. Unfortunately, the best Patinka’s student could achieve was nine of 68 – a 13 percent success rate. “There was definitely a need there,” she says. The intervention involved a tiny sandbox that Patinka’s cooperating teacher had but rarely used because of the mess factor. Patinka asked her student to write the sight words in the sand, either with her finger or with a stylus. Eventually, she scored a 62 on the sight word test – an impressive 91 percent that took her from far below the class average to above it. And while the child drew words, Patinka drew conclusions. Rieb also recorded a positive turnaround in her student as he checked his attention levels at the direction of the timer. To start the process, Rieb taught the boy how to use the timer as well as the procedure. Whenever the timer sounded, he was to document whether he was on task with a smiley face. His data sheet also contained another table where he would report whether his self-accounts were honest ones. Dalal Alfageh explains her work to Zach Wahl-Alexander. She also provided incentives for good behavior, including stickers and a bouncy ball, and soon stepped away to allow him to perform the tasks on his own. Naturally, Rieb also grew from the interaction.